...and he brought books! In particular, he brought me the copy of Dungeon Crawl Classics I ordered off of Amazon. Wow, let me just say--this is a ridiculous book. For one, it's way too big(as one review on Amazon says "At almost 500 pages, the book is fat enough to club a kobold to death with."). Additionally, some of the rules are just way too extravagant, like the lengthy section of extravagantly long spell descriptions. Also the art takes excesses in both content and quantity. And don't get me started on the annoying non-standard dice. No no, this is nothing like the clean, crisp Labyrinth Lord that I know and love. And yet... the volume oooozes fun. And it drips with authorial love for Dungeons and Dragons. And the ridiculous Magic makes playing a spellcaster fun again. 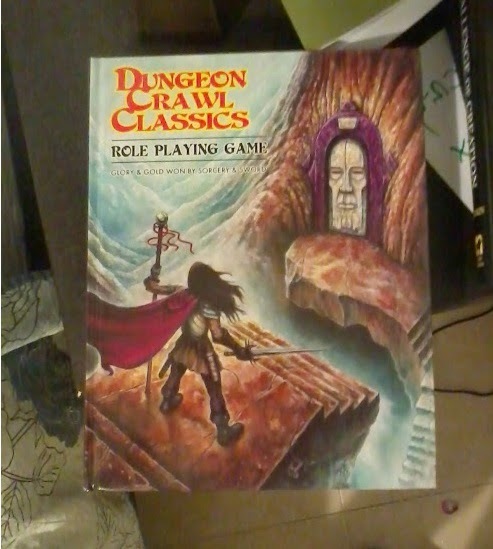 OK, so I'm actually quite pleased to be adding DCC RPG to my collection. Speaking of which, I have a dirty little secret to tell you. When I add this to my shelf of gaming books, it will sit next to such modern classics as... the 1988 "Pool of Radiance Strategy Guide" and...that's it. There's a video out there of the author of The Complete Book of Elves apologizing for writing it. It's pretty hilarious. And yes, I describe DCC as if "the OGL and OSR made hot, wet monkey love while listening to the soundtrack from the film Heavy Metal."